1. Preheat the oven to 275° F and roast the almonds for approximately 20 minutes. 2. Coat the almonds with powdered sugar and cayenne pepper, and set aside. 3. Combine the shallot, garlic, thyme, pomegranate concentrate, mustard, vinegar and oil, and season with salt and pepper. 4. Mix a handful of clean spinach with the desired amount of dressing, and season with salt and pepper. 5. 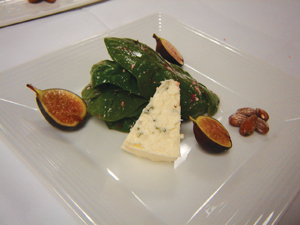 Arrange the spinach on the plate, and place next to it the figs, roasted almonds and blue cheese.